After firing James Comey as director of the FBI, US President Donald Trump asked the agency's deputy director whom he had voted for, US media report. Andrew McCabe, who had just become the agency's acting chief after the surprise dismissal last year, said that he did not vote in the 2016 election. FBI special counsel Robert Mueller is investigating whether Mr Comey's firing was an attempt to obstruct justice. Mr Mueller leads the probe into alleged Russian meddling in the 2016 election. During Mr McCabe's introductory meeting with the president after he took over the federal law enforcement agency, Mr Trump also allegedly expressed anger with Mr McCabe over his wife's ties to the Clinton family. Mr McCabe reportedly found the conversation "disturbing", according to the Washington Post. Jill McCabe, a failed Democratic candidate for the Virginia state senate, had received hundreds of thousands of dollars in campaign contributions from a political action committee controlled by Virginia Governor Terry McAuliffe, a longtime Clinton ally. Last July, Mr Trump told the New York Times: "We have a director of the FBI, acting, who received $700,000, whose wife received $700,000 from, essentially, Hillary Clinton." He also erroneously claimed in a subsequent tweet that Mr McCabe had led the investigation into Hillary Clinton's use of a private email during her time as US secretary of state. 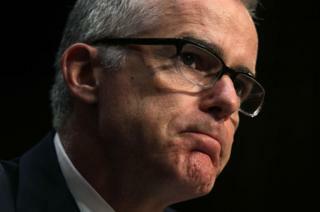 Mr McCabe had recused himself from any investigations involving Virginia political figures, but Republicans have questioned why he was allowed to be involved in the investigations into Mrs Clinton's emails, claiming he has a conflict of interest. The FBI has said that Mrs McCabe's campaign had ended months before Mr McCabe became involved in that investigation, which he later recused himself from as the date of the presidential election neared. For Donald Trump, it all comes down to loyalty. He asked James Comey if he was on his side - and the then-FBI director demurred. After sacking Mr Comey, the president's attention turned to his deputy's allegiances. While the head of the Republican National Committee may say this was just casual "conversation", Deputy FBI Director Andrew McCabe didn't think so at the time. A president inquiring about the voting habits of members of law enforcement, who should be insulated from political concerns, crosses a fairly bright line in US politics. Mr Trump has shown little regard for time-honoured political norms and traditions, of course. It was part of his appeal for many voters. The president may not have even known such questions are considered out of bounds. These kinds of inquiries risk giving the appearance of political influence in the administration of justice, however. And if a law enforcement agency is actively investigating possible malfeasance involving the president or his associates, they could be evidence of criminal obstruction. With special counsel Robert Mueller already reportedly sniffing around the matter, that should be cause for White House concern. The fresh revelations come a day after US media reported that Christopher Wray, who formally replaced Mr Comey as FBI Director last August, had threatened to quit after coming under pressure from his superiors to fire Mr McCabe. Mr Trump on Tuesday denied that Mr Wray had threatened to resign over Mr McCabe. Mr Mueller's investigation into Russian meddling has continued to dog Mr Trump, as his presidency enters a second year. Exactly one year ago on Wednesday, Mr Trump's newly sworn-in national security adviser, Michael Flynn, was allegedly interviewed by FBI agents at the White House, NBC News reported. That meeting, which Mr Flynn failed to notify his lawyers or other administration officials about, was held to discuss Mr Flynn's meetings with a Russian ambassador. Only 24 days after taking the job, Mr Flynn was fired for lying about the Russia meeting to Vice-President Mike Pence, the White House said. During Mr Comey's dinner meeting with Mr Trump before he was fired in May, he claims that the president had asked him to drop the investigation, which included Mr Flynn's communications with Russian officials. "I hope you can see your way clear to letting this go, to letting Flynn go," Mr Trump told Mr Comey, according to the former FBI chief's testimony. Director of National Intelligence Dan Coats, CIA Director Mike Pompeo, Director of the National Security Agency Mike Rogers, former Acting-Attorney General Sally Yates, and James Comey have all reportedly been interviewed by Mr Mueller's team, according to NBC.